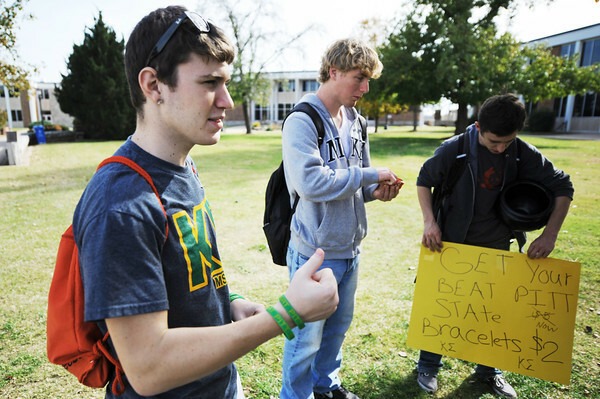 Jarrett Epperson, left, a sophomore general business major at MSSU and a member of the Kappa Sigma fraternity, absent-mindedly spints his green "Beat Pitt State" arm bands as he and fellow fraternity members look for potential sales Friday afternoon, Nov. 2, 2012, on the campus oval. Kappa Sigma is selling the bracelets to promote the upcoming MSSU-PSU game as well as to make money for a charitable organization. Also pictured are Kyle Heman, center, freshman marketing major, and Dillon Thompson, freshman mass communication major.